The Advaitist: Why is the bull so venerated in Hindu culture? Why is the bull so venerated in Hindu culture? Indus seals have bulls. 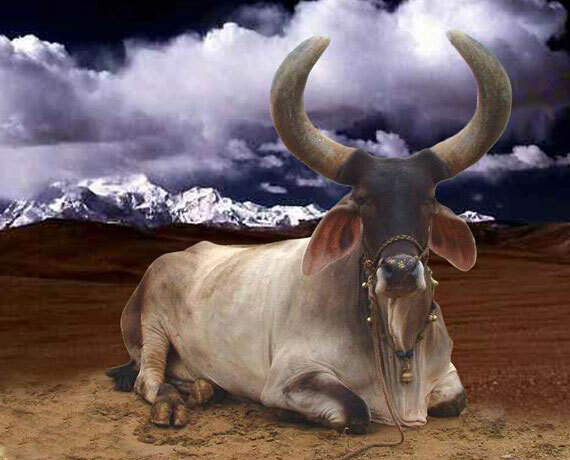 Nandi is the guardian deity of Kailasha. Shri Krishna refers to Arjuna as भरतर्षभ ( bharata-ṛiṣhabha), which means the bull like one belonging to Bharata clan. Why become bull-like? What is its significance? How is it relevant today? Today our learned Acharya, Shri (Dr) Subhashish Chakrabarti, gave a wonderful explanation during our Bhagavad Gita class, which I am presenting below to the best of my ability. A bull is a hard-working animal which works with a dogged determination. In return it gets as well as expects very little. From a bulls point of view, its philosophy is high input, low output. This is completely contrary to modern consumerist society/ engineering approach of low input and maximum output. While the latter may work successfully in the physical realm, when it comes to character development and spiritual realm, a lot of very hard work will seemingly produce very nominal output. But it is essential. And so it must be done. Karma must be done doggedly with strong determination during the contemplative/ introspective phase of spiritual ascension to purify ourselves and to equip ourselves to move to the next level. At a more mundane level, it is the attitude of a bull, rishabha which gets the "drudge-work" of any project or work or study completed. Note: People in north/ east Kolkata are most welcome to join our Bhagavad Gita class of Vedanta Institute Kolkata every Sunday morning at 9:00 to 10:30 AM in Baisakhi Mall, Saltlake. Please contact me and I will share the details.